One of the best we’ve seen, this video, demonstrating a dangerous workplace simulation for train operators, shows how virtual reality and motion controllers might revolutionise training in the work place. Anyone who’s experienced the torture of mandatory safety training and the accompanying exercises and videos will know that traditional methods to educate employees on the risks of a workplace are often less than effective. But what if you were able to step into different scenarios and environments that demonstrated these things to you? Seem to me that user engagement would skyrocket and along with it, the success of driving home the training. The Australia based Sentient Computing seem to share in this line of thinking as they recently released a video (embedded at the top of this page) showing their work on a training simulation, built to educate train workers on how to safely operate high voltage switching equipment. 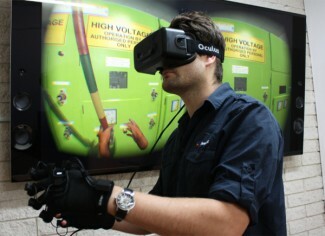 This particular experience was built for HTC Vive, with room-scale and accurate motion controllers giving trainees that all important ‘hand presence’ throughout. Arguably, attention to detail when creating an environment is more important than when lives are at stake, and Sentient seem to have taken that ethos to heart with every step of the worker’s actions from donning the safety helmet (not how the user intuitively re-orients the helmet before putting it on) to hatches on the switch gear requiring two handed operation for safety catches etc. OK, this may not be the sexiest demonstration of virtual reality you’ve ever witnessed (no zombies or jump scares) but Sentient’s work here once again emphasises the as yet untapped potential of applications utilising VR to revolutionise their potential. Putting a worker inside this environment, allowing them to safely work through procedures again and again, requiring them to physically perform motions similar to those in real life, builds muscle memory and confidence so that when they’re faced with the equipment in real life, they’ll be able to get on with the job. Sentient Computing specialise in data visualisation and training and seem to be moving more and more towards immersive techniques as part of their commissioned projects. Earlier work include this high voltage switching experience built for the Oculus Rift DK2 and Razer Hydra motion controllers (see above). It’s an interesting area, one to which VR is bringing new ways to engage people in order to help them work more safely and efficiently and although it seems awfully mundane, it’s these sorts of non-gaming applications that will help cement VR (and eventually AR) as a technology to change all aspects of our lives – with any luck, for the better. This is one of the other good usages of VR, getting your emplyees up and running Quickly, although eventually AR see trough glasses will catch up this tech more and will be the real deal as PTC Vuforia already offers.